What can a branded pressure cooker manufacturer offer you? Pressure cooker manufacturers have brought several models of pressure cooker in the market. A branded pressure cooker manufacturer not only offers you the perfect model of cooker but also ensures your safety. Pressure cooker manufacturers have brought several models of pressure cooker in the market. Pressure cookers not only vary in models but also in capacity. If you are planning to buy a pressure cooker, there are few things which you must know. You should be smart enough to choose the perfect pressure cooker for yourself. A bit of home work will make your task easier. You want something which is suitable in handling your daily cooking and does the job the way you want it to be. Three factors are discussed which will help you in choosing the best pressure cooker for you. 1) The number of people the food will be cook for- If you and your husband are the only people staying, then smaller cooker will be enough for both of you. Smaller cookers are easier to clean and also require less space for storage. If you are a part of a big family then nothing less than big pressure cooker will serve your purpose. 2) How often the pressure cooker will be used? – Pressure cooker manufacturer have brought aluminium model pressure cookers in the market for those who will do occasional cooking. Stainless steel models of cookers are best for those who are regular cooks and prepare delicacies in good quantity. These cookers last longer too. 3) What recipes do you plan to cook often? – You need to know how much psi or pressure the cooker provides. If you cook recipes which need higher pressure then going for a cooker with lower pressure will not serve your purpose. The dish will require more time to be prepared. After selecting the right kind of pressure cooker, you should always take care that you go with a branded pressure cooker manufacture. A branded pressure cooker manufacturer not only offers you the perfect model of cooker but also ensures your safety. The main aim of having a pressure cooker in the kitchen is to make the cooking process easier and faster. It is an important essential to good food and good health, hence it is mandatory to choose the right set of pressure cooker products to have a healthy living. The main objective of having a pressure cooker is to quicken the entire cooking procedure. The fundamental on which a pressure cooker works is that high pressure creates high temperature and that leads to boiling of water at a faster rate. Thus cooking becomes speedier. At one point of time cooking in pressure cooker was often considered unsafe as high pressure built-up tends to make the cooker burst out. Now the scenario has changed to quite some extent with the arrival of cookers with built-in safety features. Therefore a cooker can now be considered as safe as microwave ovens. This has also made them an absolute essential in any home. There is no limitation to dishes and recipes that can be cooked in a pressure cooker. That’s the reason they were must-haves in a kitchen during earlier times and they are still important in the same way during present times. The difference is that now they are more in use with the contemporariness attributed to them. They just don’t cut down on the hours spent in kitchen but they also play an important role in making the various dishes tastier and healthier. Thus, the pressure cooker products are becoming seemingly popular and more and more people are putting cookers in their must have kitchen appliances list. The basic design of cookers constitutes a heavy metal pot made of steel or aluminium with a sealed lid and a safety valve. At present pressure cookers are coming up with unique designs, features, patterns and thus serving many a utility in the kitchen. Sun-kwik has created a place for itself in pressure-cooker manufacturing. They also produce parts of pressure cookers, which is also available online. 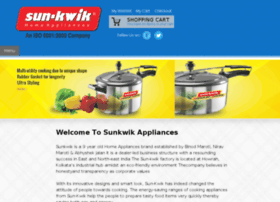 As an 11 year-old Home Appliance brand, Sun-kwik has swiftly earned its name as a leading pressure-cooker brand. Their technical know-how and expertise in the field has enabled them to reach the pillars of success quickly.Along with pressure cookers, Sun-kwik also specializes in pressure cooker parts manufacturing. Keeping every tiny bit about pressure cooker in mind they have a wide range of parts of pressure-cooker to cater every single need. 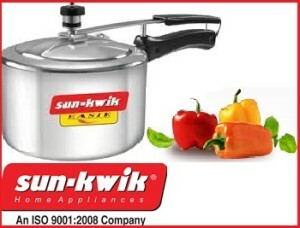 Sun-kwik is the one-stop solution for every pressure cooker related issues. The price at which they offer their pressure-cooker and its parts is also very reasonable. Quality is of utmost importance to Sun-kwik in spite of having such a competitive price. Their wide range of pressure-cooker parts include:Gasket, Lid keva, Handle Bracket, Stud and Screw, Vent weight, Safety Valve, Lid, Lid handle, Lid handle Bar, Vent weight spring pin, Vent weight spring, Aluminium cover head, Locking loop, Vent tube, Body Handle, Subsidiary Handle and Aluminium Rivets. These parts of pressure cookers help you to repair those pressure cookers, which could not be repaired due to unavailability of these parts of the pressure cooker products. With online availability of these parts you do not have to search everywhere. With just a click those parts would be delivered at your door-step. 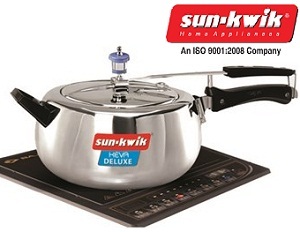 Sun-kwik knows that pressure cookers are an indispensable of part of cooking. Cooking those lip-smacking delicacies in a jiffy are now easier than ever. With your wide range of pressure-cookers win the hearts of your loved ones by cooking new and delicious dishes.